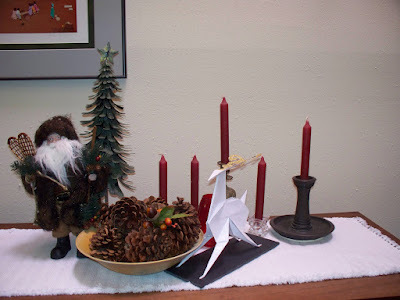 At a recent holiday show I was able to obtain an origami reindeer created by my friend, Marguerite Belkin. 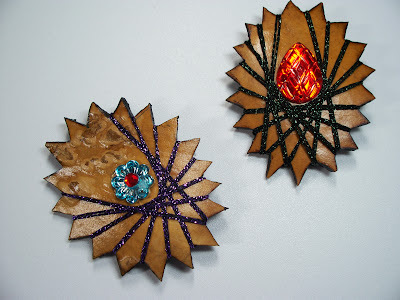 She does wonderful origami as well as other fabulous paper-based crafts. I added the reindeer to my small holiday scene and it absolutely completed the look. It was the perfect addition. You can’t see it in the picture but the reindeer and its gold antlers are made from sparkly paper. Fabulous. 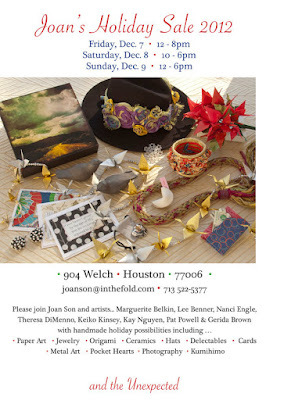 My last show for the year is coming up: Joan Son’s Holiday Sale. As it is said – it may be the last but it is certainly not the least. We always have such a great time. There are a total of 9 artists participating. Each is skilled in a different discipline. It makes for a very interesting show. This year I will be bringing only my braids(kumihimo). Oh, and of course, my pepper jelly will also be available. In case you can’t see the details in the photo, the sale is Friday, Dec. 7th (noon – 8pm), Saturday, Dec 8th (10 – 6pm) and Sunday, Dec 9th (noon – 6pm). The location is Joan Son’s studio on 904 Welch (behind Texas Art Supply on Montrose). For more information check http://www.joanson.com.